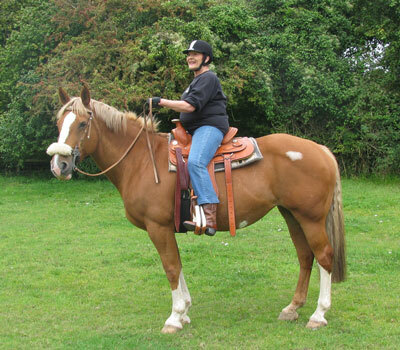 The idea to bring Western horse riding lessons to Wildwoods was born form Anthea’s own experiences as she travelled abroad. During a trip to Silver Spur Ranch in Idaho, she stayed with the Tomlinsons, helping to round up a herd of young Pintos and bring them down from summer grazing in the high pastures to the lower winter pastures. The thought occurred to her that learning to ride Western would be useful for clients that wanted to savour the dude ranch experience! Shortly after her trip, we got our first set of Western tack from a friend. The job was on to train some of the horses to ride western style. Each horse chosen took to the task easily and in many cases they have improved their own way of going, learning to work in natural balance. The horses take to it very quickly and “switch” to Western mode as soon as the Western tack goes on. They really enjoy it and love the neck reining and will spin on a sixpence in canter! 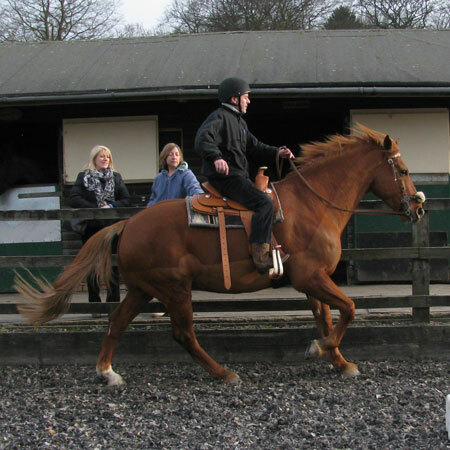 It helps the rider to become more relaxed and balanced in the saddle and to become much more versatile. Although we have some long shank bits, we usually start with a snaffle or hackamore (bitless bridle), until the rider gets used to “letting go” of the contact and using their weight aids. Western holidays can be arranged.at Kara Creek Ranch, Sundance Wyoming Experience the cowboy life in the seclusion of the Black Hills. Guests will have the opportunity to take a leading role in all the ranch’s activities. The main property is about 300 acres with 5000 head of cattle and grazing grounds of 30,000 acres. It is a working ranch and the cattle are driven to summer and winter grazing spring and autumn. April is calving time and May and June are the long awaited months for branding the new calves.